This collector's edition of Lupin the 3rd: The Castle of Cagliostro includes the 1992 Streamline English dub, the 2000 Manga Entertainment English dub, and the 2000 Family Friendly English dub, as well as an all-new English subtitle translation and a restoration of the 1980 theatrical subtitles. In the twilight of his career, master thief Lupin the Third's latest and greatest caper has hit a snag. What should've been bags of cash from a national casino turns out to be expert counterfeits! Together with his partner-in-crime Jigen, Lupin heads to the remote European nation of Cagliostro to exact revenge. Not everything goes as planned; the two encounter Clarisse, a royal damsel in distress being forced to marry the sinister Count Cagliostro against her will. Saving her won't be easy, however, as Lupin and Jigen - together with Lupin's unpredictable ex-girlfriend Fujiko and the swordsman Goemon - must fight their way through a trap-filled castle, a deadly dungeon, and an army of professional assassins! Can Lupin rescue the girl, evade the cuffs of his long-time nemesis Inspector Zenigata, and uncover the secret treasures of The Castle of Cagliostro? Special Features: Feature Length Original Storyboards, Interviews with Cast and Crew, Commentary with Reed Nelson, Art Gallery, Original Trailers, Opening and Endings Collection, Translation Notes. An excellent re-release of a timeless classic. Castle of Cagliostro maybe one of Lupin the 3rd's finest films. Excellent animation, music and story that still holds up today. Definitely one of Hayao Miyasaki's best films. 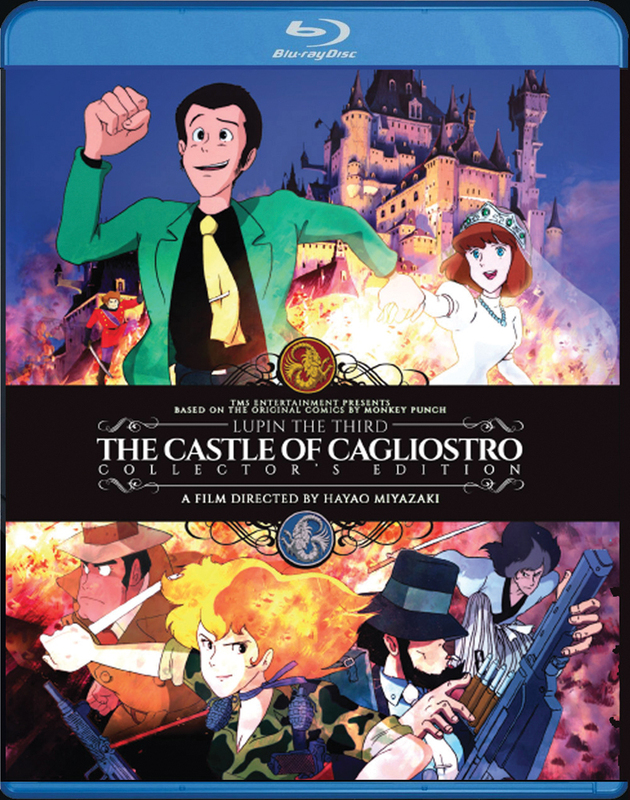 Now for this release, Discotek has not only given us Castle of Cagliostro in cristal clear 1080p image, but alternate audio tracks from all previous releases of the film but is also chuck-full of extras like interviews, promotional artwork and other goodies previously not available in past releases of the film. As an anime fan or in animation in general, you owe it yourself to have this film in your collection. The care and effort that went into this Blu-ray release of Miyazaki's Castle of Cagliostro are obvious. This is a "collector's edition" that actually lives up to that title with multiple audio tracks (even a "family friendly" version of Manga's English dub, which inserted unnecessary profanity that doesn't really fit the film) and a plethora of special features. Almost the entire 50 gig disc is packed with good stuff and the movie itself has never looked better. Highly recommended. Simply put this is an awesome movie filled with plenty of action, comedy, and great music. Discotek/Eastern Star did an incredible remaster of this film. This movie is a must-have for your collection. THANK YOU, Discotek for giving this movie a proper reissue and NOT giving a crappy star-celebrity dub like Disney's other Ghibli travesties (the worst dubs of all time IMO), AND for retaining Streamline's dub! Their dubs have always been perfect, with real voice actrs who can act and with perfect translations. The newer dub is atrocious, though. Don't watch that. (And yes, I say this as a Solid Snake fan; Hayter simply BLOWS as Lupin; Bob Bergen is SOOOOOOO much better.) If that new dub had been excluded, this would be perfect. Either watch with Streamline's dub or Japanese. Otherwise don't even bother. Miyazaki's debut feature was, and still is, a lot of fun, and a terrific animated feature to boot. Packed with excitement, humor, and even a small touch of romance as well as mystery and intrigue, THE CASTLE OF CAGLIOSTRO may not have the artistic polish of Miyazaki's later work, but the director's trademarks are still in gear, and it's hard not to be won over by this film. Discotek Media's presentation is also a fine example of how movies like this should be done. Both dubs are included, the Japanese language track is there, and there are interesting extras. Of the two dubs, I honestly am preferential to the one with David Hayter -- perhaps because that's the version I saw first. I could've done without the profanity, but the dub is honestly fine. The Streamline dub has its points, but it's not that great, to be honest. No matter which version you see, you're still going to experience a great film, period. The castle classic - a laudable Lupin release! If you combined the intrigue & music of a James Bond film with the artistry of a classic Disney animated film - plus maybe a few story quirks from 'The Princess Bride' - you might end up with a product resembling the delightful, exciting escapades of 'The Castle of Cagliostro'. Discotek has delivered a praiseworthy package for this historical anime film. Video presentation is excellent, and numerous Japanese/English audio options with different subtitles are available. I have yet to try every one, but their mere inclusion altogether is admirable. A healthy variety of bonus features is also (thankfully) included, such as interviews with the staff, handy translation notes, detailed looks at promotional art, and a thorough text history of the film's conception. 'Cagliostro' is a genuine anime classic, and Discotek deserves full marks for this top-of-the-line presentation. Be sure to add it to your collection!